The year's loveliest film, if not the best so far in 2018, arrives today in the form of the documentary brilliance of writer/director Morgan Neville's "Won't You Be My Neighbor?" 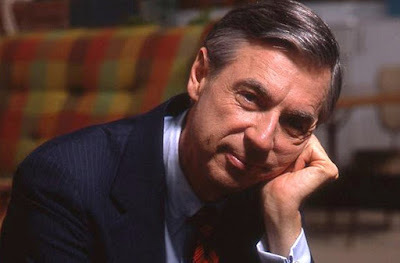 The one and only Fred Rogers still mesmerizes as a great "Neighbor." Probably the title alone, the familiar singing catchphrase of the Public Broadcasting System's most famous star, lets you know that it showcases Fred Rogers, whose 50-year-old "Mister Rogers' Neighborhood" still plays on a number of PBS outlets a full 15 years after his death. Neville's own name may not be as recognizable, but his resume includes a Best Documentary Oscar for "20 Feet from Stardom," a moving and often fascinating telling that offers an assortment of little-known tidbits about the entertainment industry while shining its primary spotlight on back-up singers. Happy to report that Neville manages the same trick here, despite a subject that you'd think everyone already knows, even if they've never watched a single one of the 895 episodes Rogers so gently hosted over the course of 31 TV seasons. The Pittsburgh-based Presbyterian minister, then 35, debuted on PBS in 1968, and continued making new episodes of his "Neighborhood" on and off until the last one aired in 2001. Many of the show's highlights, which include absolutely amazing moments with Rogers tackling racial intolerance and easy acceptance of children with disabilities, are incorporated by Neville and, it says here, will bring tears to the eyes of anyone with a heart. Nice memories from Rogers' wife, two sons and various cast/crew members paint a vivid picture of the man as well. Then again, there's an array of clips from show-biz types either making fun of the host with impersonations or offering up interview questions that likely would not be asked today. Regardless, there's no doubt that the film's unqualified star remains Rogers himself, whether sitting strong to convince Nixon-era tough guy John Pastore to increase funding for public television, or simply talking smart sense to the millions of kids watching him and his puppets on the other side of the camera. There's little doubt those young viewers adored him, just as their own children and even grand kids still do today.